A step on CITY TOUR of Rockford, IL is a wonderful addition to your package and costs $2 per person. See our schedule for show dates. Additional Rockford Dates are opened for your group of 35 or more people. Historic Auto Attractions, located just off of I90 in Roscoe, Illinois is a collection of over 75 special interest autos. Your group will LOVE this attraction combined with our luncheon and matinee show! Each display is artistically designed with graphic illustrations and historical information. Sanford & Son�s truck, "Famous Cars & Stars" (Marilyn Monroe�s dress from "Diamonds Are A Girl�s Best Friend", Conway Twitty�s Lincoln Continental) and "Cars of the Presidents" are favorite stops. The "Kennedy Day In Dallas" is a moving tribute to President John F. Kennedy. 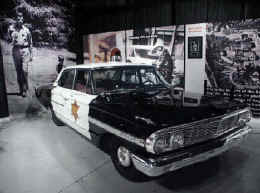 Another of our personal favorites is the original patrol car from "The Andy Griffeth Show". Next it's on to one of our fine dining venues for a great, served meal and upbeat musical concert that your group will love. Each of our shows is filled with big band hits, country, oldies and family-style comedy with our group of professional entertainers and musicians. 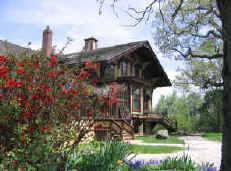 A morning visit to the beautiful Tinker Swiss Cottage in Rockford is the first stop on this tour package. "Tinker" has been called a treasure trove of a time gone by and it's loved by the many visitors who come to experience it's rich history. Robert Hall Tinker built the home in 1865, perching it high on a limestone bluff overlooking Kent Creek. His inspiration came from an 1862 tour of Europe where he fell in love with the architecture of Switzerland. Your group will love stopping by the Museum Store which is flilled ot the brim with unique gifts and souvenirs. It's back on the coach for a personalized guided tour of Rockford by our talented Convention & Visitor's Bureau Representative show is a very knowledgeable source of information regarding the founding of and the history of Rockford. She's one of the most entertaining city guides that you will ever have. After your city tour it's on to one of our fine dining venues for a great, served meal and upbeat musical concert that your group will love. Each of our shows is filled with big band hits, country, oldies and family-style comedy with our group of professional entertainers and musicians.